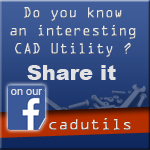 ...do you want to submit your CAD Utility ? Your CAD Utility will be published in this part of the website, and you will be enabled to edit it online. Advanced Smart Unfold For Rhino can unfold developable or non developable surfaces. User can select multiple surface patches, and all selected surfaces will be unfolded as if they are a single surface. It is the only tool in the world that can unwrap multiple surfaces into one contour. Advanced Smart Unfold for Inventor can unfold developable and non-developable surfaces. Users also have the option to select multiple surface patches, which can be unfolded as if they are a single surface. It is the only tool in the world that can unwrap multiple selected surfaces into one contour. This plugin will work for Inventor 2008 and all later versions (32bit or 64bit).